ARTICLE NEUF. 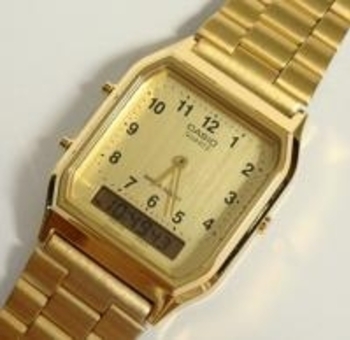 MONTRE CASIO VINTAGE POUR HOMME OU FEMME. ANALOGIQUE ET DIGITALE. LIVREE AVEC PILE ET MANUEL. BOITIER ET BRACELET EN METAL DORE TRAITE HYPOALLERGENIQUE. METAL CHIRURGICAL. TRES CHIC. GARANTIE 1 AN. LIVRE DANS SA POCHETTE. PRIX : 50 EUROS. LIVRAISON INCLUSE. SI VOUS ETES INTERESSE LAISSER UN COMMENTAIRE AVEC VOTRE EMAIL POUR CONTACT. PAIEMENT CHEQUE ET PAYPAL ACCEPTE.